Preheat the grill to medium-high heat or your oven to 400F. Rip off a 1ft by 1ft square of tinfoil for each foil pack - you can cook each chicken in it's own individual packet for easy serving. 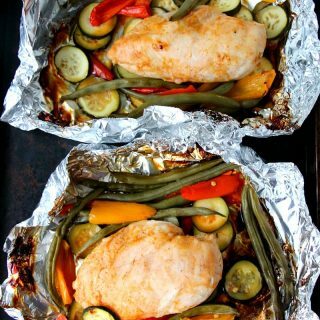 Place 1/4 of the veggies in the center of each foil square and then place the chicken over top. Spread 2-3 Tablespoons of BBQ sauce on each chicken and drizzle olive oil over the chicken and vegetables. Season with salt and pepper to taste and then place a second square of foil over top and crimp the ends in to form a sealed foil pack. Bake or grill for 30-35 minutes until the chicken reaches an internal temperature of 165F. Be careful when opening the pack as there will be hot steam released.